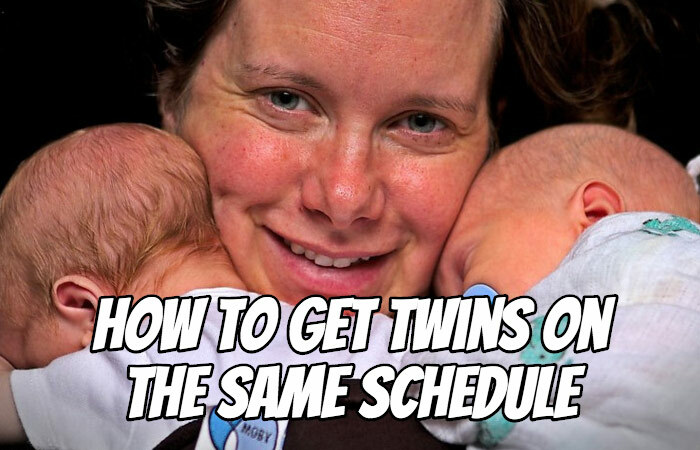 Getting your twins on the same schedule will help maintain your sanity and control the chaos in your home. Unfortunately, it isn’t always easy to keep the twins on the same schedule. Keeping your twins on the same schedule depends on a few factors, but primarily comes down to the time of day and how many helpers you have. A schedule starts with a predictable routine of events during the day not necessarily tied to a time on the clock. Children respond very well to routines. This is especially true with twins. 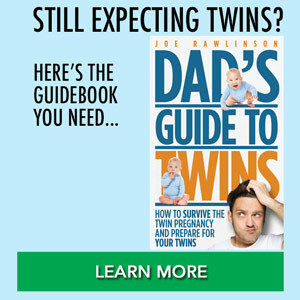 Since they are the same age, you can find a comfortable routine that works for both twins and do that every day. With routines, your twins will know what to expect and will positively respond. There are no surprises for them and it is very comforting and reassuring. Do not starve your children to force them into a strict schedule. Ease your way into a more predictable schedule. Take your cues from what is working and what your twins need. As always, please consult your pediatrician for more specific daily schedule advice that is tailored to your individual twins. I’m a big fan of The Baby Whisperers’ EASY steps. Once the twins [E]at, have some [A]ctivity time and go to [S]leep, [Y]ou can relax a little. When they’re sleeping it’s time for you to take a break and catch up on the things that you have to do. We found this EASY formula very valuable with all four of our children including our twins. What age is it best to try to get twins on the same schedule? 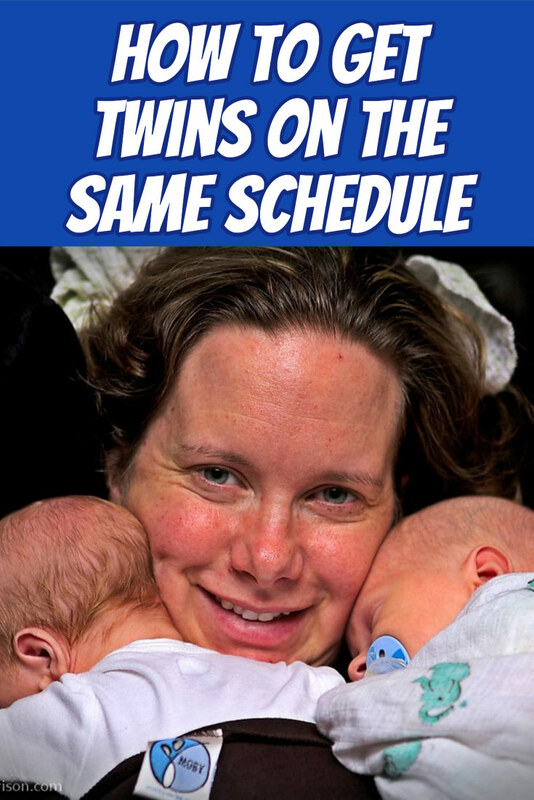 We tried to get our twins on the same schedule from the very beginning. Even in the hospital, we tried to feed them at the same time. When we brought them home, we tried to continue that pattern. Now is a great time to try to create the schedule and routine you want. The longer your twins are entrenched in an existing schedule, the harder it’s going to be to get them to switch. No matter how old your twins are right now, today is the perfect time to start getting them on a schedule. As you’ve likely found, if you take care of the twins one after the other, there’s really no end to that cycle (especially when they’re infants). By the time you finish caring for one, it’s on to the next twin. By the time you finish taking care of that twin, it is right back to the first twin. This is where a synchronized schedule really shines. When you get them to eat and sleep at the same time, it will give you a break before you have to feed again. We all know you need a break no matter how small it might be! Keep good records of feeds, sleeping times, and diaper changes. This will help you stay on schedule and the doctor will also want this information at well-baby check-ups. Once you have a running log of your twins’ activities, it will be easier to see what is working and what isn’t. You can then adjust your routine based on data instead of relying on your fuzzy, sleep-deprived brain. The key to getting both twins on the same feeding schedule is to feed them at the same time. One parent can feed both twins simultaneously with practice. Or if you’ve got two adults available, each can feed a twin at the same time. When our twins were infants and one would wake up hungry, we’d wake up the other to feed her as well. The sleeping twin didn’t always eat as much as her sister but she still typically got enough to hold her over until the next feeding cycle. If it is just you (or your wife) taking care of the babies during the day then it might be to your advantage to have the twins on a slightly staggered schedule. This allows the caregiver to be able to feed and diaper one baby at a time. There will be a little less time for you, and it may feel like you are in a never-ending cycle of feeding, changing, and napping babies all day long. Ideally, you’d keep the twins on the same schedule and do everything in tandem. As you grow in your caregiving skills and/or after help goes home, you’ll find that you’re able to keep the twins on the same schedule (even by yourself). While your twins are still young enough to take naps, you need to make sure they actually get them. This may mean separating your twins for nap time so they don’t keep each other awake. You want your twins to nap at the same time so they will be able to go to bed at night at the same time. Both twins won’t always sleep when it is nap time or for the same amount of time, but you need to give them both that opportunity. Every good night’s sleep starts with a predictable and relaxing bedtime routine. Once your twins are winding down, they will fall asleep more easily and you’ll be ready for the night ahead. Caring for twins overnight is a handful, to say the least. If you don’t have a 1:1 adult to baby ratio with twins at night, you’re going to run yourself into the ground very quickly. Stop right now and get help. As I mentioned above, night schedules revolve around feeding. Yes, it is OK to wake a sleeping baby! We found it best that when one daughter woke up hungry, we’d wake the other daughter and feed her at the same time. This helped us avoid servicing one baby, getting her back to bed, and falling asleep just to be jarred awake by the next hungry baby. Different Size Twins on the Same Schedule? Is it possible to get twins of different weights and sizes on the same sleeping and feeding schedule? Yes! Focus on the start of the feeding cycle. Start both twins feeding at the same time. Because the twins are different sizes and weights, they are going to eat different amounts and may finish eating at different times. For example, if baby A feeds for 15 minutes and baby B feeds for 10 minutes, still start your next feeding based on when you last started feeding them both. When you get the feedings in sync, the rest of the schedule will fall into a good routine. Beware the consequences of getting your twins off schedule. They will be sleepy, cranky, fussy, unpredictable and a challenge when they are off schedule. You’ll have life events that mess up the schedule. Vacations, visitors, illness, etc., will all throw a wrench in the works. This is natural, and as long as you are expecting it and stay flexible, you will be able to adjust. Keep in mind that it may take a day or more to get the twins back on schedule once life gets back to normal. About the time you get comfortable with your routine, something will change. Roll with it. 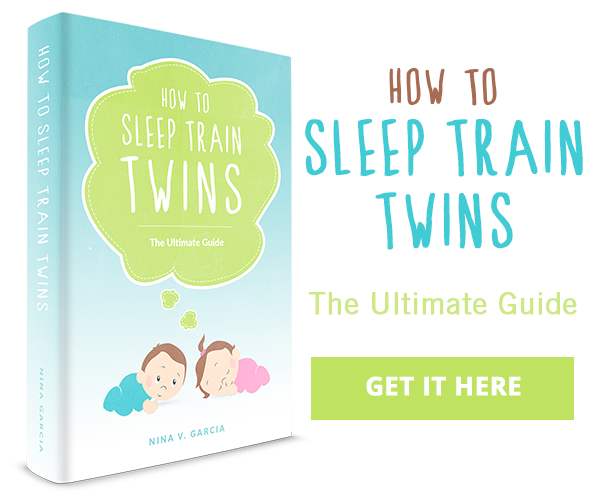 As your twins grow, their sleeping and feeding schedules will naturally change. Expect this and adjust when necessary. If something is not working, it’s okay to adapt, change, and move on to something else. However, give something a try for long enough to really see if it will work before you give up and switch schedules. The older your twins get, the easier it will be to align their schedules. Have you had success with getting your twins into a routine or schedule? What has worked for your family? Please share in the comments.